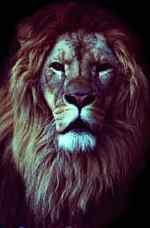 God made the lion. The scientific name for the lion is felis leo. Lions are some of the largest and most famous members of the cat family. Lions inhabit Africa and southern Asia to western India. A fully grown male lion can weigh between 400-600 pounds. Female lions are smaller and lighter than males. Lions live to be about 30 years old. By the time he is 5-7 years old, the male is easily identified by a luxiant mane that grows on his head and neck. The female has no mane. Lion coats are a beautiful tawny color. The lion's amber eyes reflect light. Lions have excellent night vision which is good for hunting. The lion is a strong, ferocious carnivore. 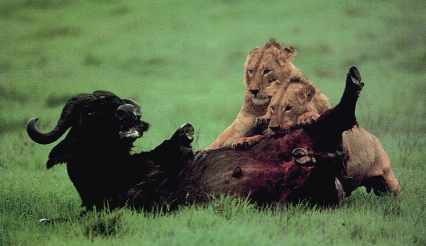 Lions eat animals such as zebra, wildebeest, hartebeest, antelopes (e.g., impala), and water buffalo. The water buffalo can be dangerous to a lion and is not the easy prey many would suppose. Lions will also kill domestic cattle and ostriches. When hunting, lions oftentimes lurk near water holes where animals come to drink--and then pounce on the unsuspecting. Lions like to eat the animal's soft entrails first and then move on to the rest of the animal. After eating, a lion can drink up to 10 gallons of water. The lion has no natural enemies other than parasites. Lions and hyenias are not the best of friends, however, the biggest hyenia is no match for a lion. Most lions have worms and are known for their high cub mortality rate. Lionesses begin reproducing at about 2.5 to 3 years of age. They reproduce once per year at any time of the year. A litter usually consists of 3 to 6 cubs after a gestation of 108 days. Cubs are weaned after about 3 months. Some lions acquire the habit of eating people. These animals must be killed promptly because they won't stop. Man-eaters can be old lions with worn down teeth or they can be lions in their prime. A famous example are the two lions known as the "man-eaters of Tsavo". These lions regularly killed and ate the men working in construction gangs--until shot by an engineer in charge. The lion has keen senses of hearing, smelling, and sight. Their night vision is extremely keen. 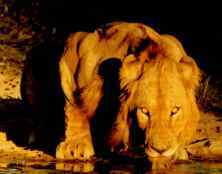 The loud roar of the lion can be heard from the early evening throughout the night. Roars can be vocal challenges or warnings to other males in the distance. Lions sleep through the heat of the day (nearly 20 hours everyday!) but are easily aroused with the slightest sound. In the early days of the Christian church, the Romans fed Christians to the lions as a form of entertainment. So as to keep their stocks of lions replenished for this despicable practice, they developed breeding establishments. To the present day, lions breed freely in captivity, especially in locations where the climate is mild and warm. Go here for more pictures of lions!